I live on an island in Maine. I haven't always been here but I think my soul was born on the Maine coast. Ever since I moved here I have wanted to paint. But for whatever reason, it wasn't until after I opened Couleur Collection, a specialty store which sells art and fashion, that I finally got serious about painting. One of the first artists featured in our store/gallery invited me to her class at a local university. I was hooked. One class led to another. I began painting places I love in Maine. Later, as I began to travel to Italy to buy jewelry and accessories for Couleur Collection, I started to paint what I saw on those trips. Now I try to work 60% and paint 40%. Life is all about balance and I am doing the best I can to integrate my art, my business, my health and my family. 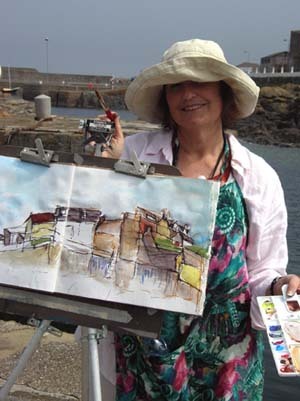 PS The photo on the page was taken this summer while I was painting in Scotland. I often use my sketchbook on location and make the actual paintings when I return home.